It is only natural that users who are highly interested in computer games have more than just one gaming application on their systems. Perhaps you have Games Bot on-board too, but if that is the case we would highly recommend that you remove Games Bot from your computer as this application is related to specific computer security issues. It is for the best to delete such programs like Games Bot from your system if you want to protect your computer from harm. For a full manual removal guide, please scroll down to the bottom of this description. Games Bot is a potentially unwanted application, so it is not a malicious computer infection. Nevertheless, users often do not understand which programs could be trusted, and which should be removed from their systems at once. 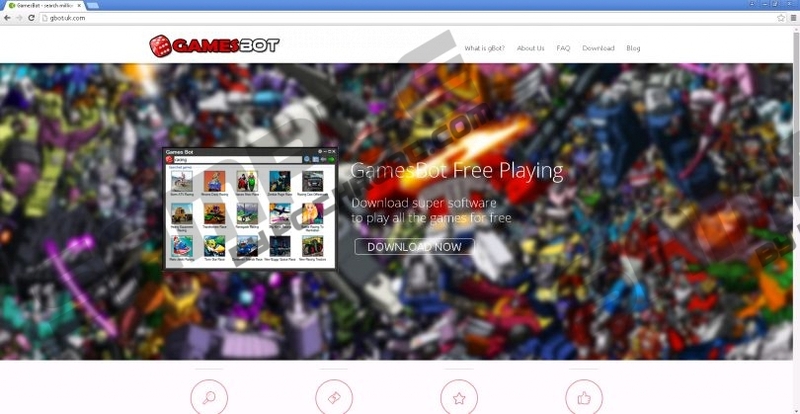 Games Bot looks trustworthy because you can download the application from gbot.uk.com. Take note, however, that the program is available for download only for users in the UK and the US. In other words, if you don’t have the US or UK-based IP address you won’t be able to download Games Bot from its official website. On the other hand, such applications often employ more than just one distribution method, and Games Bot is no exception. Our research shows that Games Bot is commonly bundled with third-party downloaders that you can come across on various file sharing sites and even torrent pages. You have to remember that if you download Games Bot bundled with other programs, you clearly have more unwanted applications to remove from your PC. In fact, sometimes users aren’t even aware of the fact they have Games Bot on their computers because they weren’t aiming for this application in the first place. Thus, it is only natural that sometimes users consider Games Bot a dangerous virus that entered their systems uninvited. Although Games Bot is NOT a malicious computer infection, you should think twice before you allow the program to remain on your system. After all, Games Bot can auto-start with Windows and use a lot of your system resources, thus slowing down your computer to the point it makes the usual tasks seem extremely tedious. What’s more, Games Bot may also display commercial ads that could contain unreliable content. As you can see, Games Bot is related to multiple computer security issues that you shouldn’t overlook. Uninstall Games Bot right now via Control Panel and then do yourself a favor and run a full system scan with the SpyHunter free scanner. You need to terminate other unwanted applications as well, and the best way to detect them is to use a licensed antispyware tool. Select Uninstall a program and remove Games Bot. Go to Uninstall a program and remove Games Bot. Select Add or remove programs and uninstall Games Bot. Quick & tested solution for Games Bot removal.